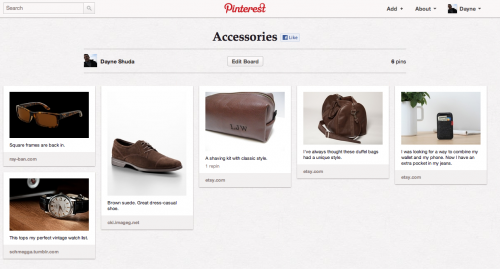 Pinterest is a buzzword on the Web today. The pin board service is becoming popular among its users. The website allows people to pin images from around the web to boards within Pinterest. It seems people like the fact that they can show off their individual style with categories like fashion, footwear, decor, accessories and much more. As the site gains in popularity, businesses and websites are also learning the power of Pinterest. As a result, companies are looking for strategies on how to connect with Pinterest users. These companies are looking to connect, bring traffic back to their sites and eventually earn some additional sales. An article on the AMEX Open Forum I think hits on a great strategy for connecting with Pinterest users. Pinterest designer and co-founder Evan Sharp sums it up well: “For most consumer brands, the idea behind your brand makes sense on Pinterest.” Since you’re not supposed to blast pictures of your products on Pinterest, try to think outside the box and pin images that capture a lifestyle and/or the essence of your brand. Pinterest calls for a more holistic approach to marketing, and it can be more effective and engaging than traditional advertising because the consumers can really see how your brand fits into their lives. With Pinterest, it’s about lifestyle. Many brands can use this strategy not only on sites like Pinterest and others, but also on their own Web properties including a blog. Companies such as Gap, Land’s End, Sanuk and others are finding success with a lifestyle initiative. These companies understand how their customers think. Their customers have a certain style. In each case, these customers feel like they are individuals and like to express themselves on sites like Pinterest. Land’s End has been holding contests on Pinterest. The goal is to tap into the expressive nature of their best customers and give them reason to share the emotion of the Land’s End lifestyle. It’s about the products, but it’s also about the entire image of the brand. The lifestyle appeal of which the Land’s End products are a part of is bigger than the brand itself. People are interested in an entire lifestyle. If a brand can show that its products are part of this lifestyle can find themselves winning over new customers. The lifestyle angle works great on sites like Pinterest, but it can also work well on your own property including a company blog. With your blog, you can add images to posts while discussing aspects of a certain lifestyle. Focus on the lifestyle your target customers strive to lead. Focus on their style, their personality and the hobbies they like doing. You can work these angles into your blog posts and connect with people on a personal level. By focusing on lifestyle you will be in much better position to get response from your target customers than if you just focus on your own products exclusively. One of the difficult things with blogging is not being to forward with the fact that it’s a branded blog. It can be difficult to find this balance. With focus on a lifestyle you can connect with readers and as they become comfortable with your blog they will realize – on their own – that your brand can be associated with their lifestyle. Connecting with readers on a lifestyle level can take some hard work and time, but that’s how blogging works. It takes time to build a readership and build a file of readers that become customers. But like anything, this process is well worth it in the long run.